Spring is near and that means so is the Houston Japan Festival. 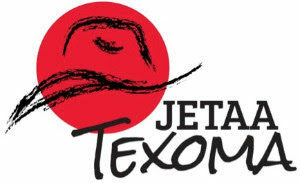 This year Jfest will be held on April 13 and 14 and TEXOMA JETAA will have a booth again this year. We would really appreciate if some of you could help us man the booth over the weekend and tell attendees about the program and your experience. We will also have some Japanese games out to play with kids. If you can volunteer please sign up here. We try to limit our mass emails to everyone but there are few things I wanted to everyone to know about. Adam Hammick and I will be attending this conference on behalf of Texoma JETAA and welcome any feedback from our members before we go. Do you have event ideas or questions? Let us know and if we don’t know the answer we can ask the big shots in San Fran. As always any requests or recommendations on how we can improve our chapter are welcome so email us anytime. Come one come all! we will be having an End-of-Summer barbeque just north of downtown Houston. Come on down and enjoy that last little bit of the searing summer sun before it’s gone (in approx. 3 months). Standard BBQ Food and drink will be provided by JETAA, but feel free to bring anything special you might be interested to eat and share. JETAA will also be taking charity donations for The Alliance for Multicultural Affairs, so bring some cash! We are very excited to officially announce the Texoma JETAA Central Texas Camping Trip (aka the JETAAstrophe). We would like to invite both members of JETAA, their families, and friends to Central Texas for a weekend of good times. The event will take place on October 5-8 at Garner State Park. If you are planning on coming, please fill out the form at the “continue reading” link by September 15th. We are currently in the midst of planning a camping trip somewhere in central Texas. Our hope is that as many people from around the state will be able to make it. As for the time being, we have only the date to announce – Friday, October 5th to Monday, October 8th. We will announce further details as the plan comes together. We hope to see you there! Ms. Michiko Miyata will be holding a beginner calligraphy class on the UT Austin campus. It will be a beginner class, and all materials will be provided. No reservations are necessary! This class will be a test run, and if it goes well, it may become a regular series during UT’s summer semester beginning in June. Please contact Adam with any other questions. We are going to try to have Trivia night on the first Wednesday of each month starting THIS WEDNESDAY. Please join us so we can discuss our JETAA plans for the year STARTING WITH JAPAN FEST!!! J-Fest is right around the corner and we need to talk shop. If you can, email Drew (president [at] texomajetaa.org) before tomorrow at 2:00PM it will help us get better seating.